Jake Eberle of Le Fond grinds up spicy lamb merguez sausage using shoulder, belly and fatback. This terrine is a labor of love. In New Chefs Rising, Food Republic finds young cooks who are making moves, running their own kitchens in successful restaurants, in many cases before their 30th birthday. Enter: Jake Eberle of Le Fond in Greenpoint, Brooklyn. “I like to celebrate tradition and fundamental technique,” says Eberle of his recipe for Moroccan merguez lamb sausage. 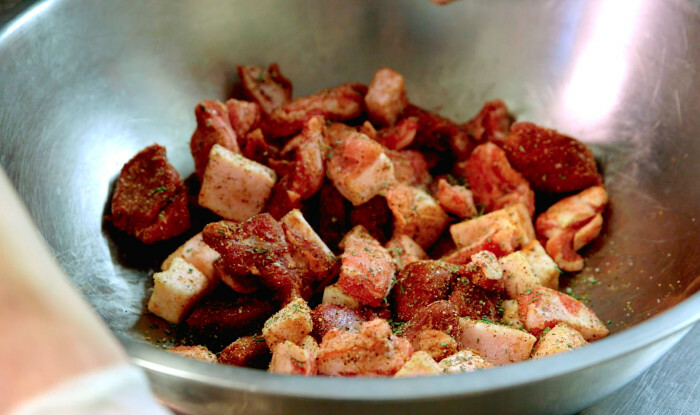 “This is what that’s all about.” Pork fatback keeps the mix juicy and flavorful, and a complex spice blend and plenty of garlic confit make his preparation a meat-grinder must. Check out Eberle in action below — this merguez terrine is a slice you won’t soon forget — then try the sausage recipe at home. Freeze the lamb shoulder, belly, and fatback for about 15 minutes, or until firm to the touch. Remove from freezer and season with spice blend and salt. Grind all the ingredients in a meat grinder, then knead the mixture using your hands until spices are thoroughly incorporated. Do not overmix. Store in a tightly sealed container for up to four days until ready to use, or freeze for up to three months.